In order to share excitement of sports, information service plays a very important role. TECHNONET is delivering various kinds of information in real time to various media. 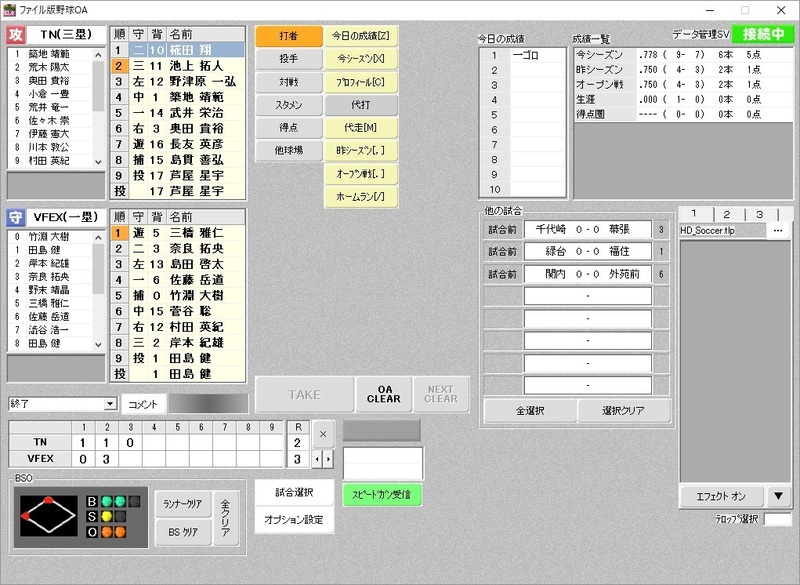 TECHNONET is developing graphic systems that display competition records in real time for large-scale screens in Japan’s professional baseball, home ground stadiums of J-League, Japan’s professional Football league, and other stadiums. Utilizing the experience cultivated in live broadcasting of television broadcasting (sports, news, variety programs, etc. ), we update the player name prepared with yesterday’s record, the game record that progresses every minute and design an operation system that is easy to control while combining live source. We are offering the best operation system for the site for each stadium. Digitizing accurate sports events in real time is indispensable not only for enjoying sports profoundly but also for building strategies for the team and, most of all, for recording the performance of athletes. In some sporting events, you also need to record data from measuring instruments that measure position and weather information. Depending on the type of sports, there are cases where there is no special system engineer, so ICT utilization is not always sufficient. TECHNONET has developed a recording system for several sports. Various sports data is an essential metadata for reusing accumulated recorded images. TECHNONET has developed and provided “Information Monitor" which displays game data to staff related to sports events including broadcast media. Displaying information is indispensable especially for sports where multiple players progress at the same time, such as racing competitions, golf, athletics and gymnastics competitions. TECHNONET will be an optimal partner to realize information display according to various devices, such as mobile terminals, displays, large displays temporarily installed in the venue. TECHNONET has handled various information of sports. Along with the evolution of video media, users are now able to watch sports in various situations. TECHNONET has a system that delivers necessary information to all people who watch sports in real time. CG System for Large-scale Screens *Stadium names are the names at the time of installation. Shoda Shoyu Stadium, Gunma Pref. Wakasa Stadium, Kyoto Pref./ Denka Big Swan Stadium, Niigata Pref./ Main Stadium in Atsubetsu Park, Hokkaido Pref./ Matsumotodaira Athletics Stadium, Nagano Pref. Rakuten KOBO Stadium, Miyagi Pref./ QVC Marine Field, Chiba Pref. /Fukuoka Yahuoku! Dome, Fukuoka Pref. Nagoya Dome, Aichi Pref. /Kashima Soccer Stadium, Ibaraki Pref./ Toyota Stadium, Aichi Pref./ etc. ECOPA Stadium, Shizuoka Pref. /Kamoike Athletics Stadium, Kagoshima Pref./ etc. Information Monitor for Golf/ CG Graphics for Large-scale screen/ Monitor for Motor Sports Race/ Information Monitor for Track and Field/ Volleyball Competition Recording System/ Information Monitor for Ekiden and marathon/ Information Monitor for Gymnastics Competition/ Operation Monitor for other competition/ etc.